The setting was perfect: it was just the second theatre showing ever of I Sell The Dead, it was the North American premiere, it was the final film of the best-ever third edition of the Toronto After Dark Film Fest, and in attendance were director/writer Glenn McQuaid, producer/actor Larry Fessenden, actor Angus Scrimm, actor Brenda Cooney, and producer Peter Phok. You could feel the buzz. And hardly miss Mr. Scrimmâ€™s ultra-funky white glasses. Arthur is the erstwhile partner of the recently-beheaded, underachieving graverobber Willie Grimes (Larry Fessenden plays himself with an Irish accent) and he relates the episodic history of their freaky, yet hilarious adventures during 15 years of body snatching somewhere in rural Ireland. We accompany our two heroes -- Arthur progresses from boy apprentice (convincingly played by Daniel Manche) to adult partner -- while they fumble through an increasingly dangerous series of dark, yet somehow innocent robberies. Innocent? Well, maybe theyâ€™re just ignorant. OK, hereâ€™s an example: in one story they dig up a female vampire. They have no idea what she is. Curious, they discuss and discard the string of garlic around her neck. Then they notice the oak stake through her heart. Confused now, they discuss the possible meanings of this odd wooden cipher, and decide to remove it to make transporting the body easier. Yes, mayhem ensues. Yes, our heroes survive. Thatâ€™s the way it goes. Arthur tells Father Duffy a yarn, which we cut to, and then itâ€™s back to Duffy and Arthur, repeating the process until all the little stories are told and the big picture unfolds, amusing us with a suitably surprising and haplessly happy ending, structured in such a way that yes, there may be a sequel opportunity for those lovable degenerates, Willie and Arthur, depending on the successâ€¦ you get the picture. 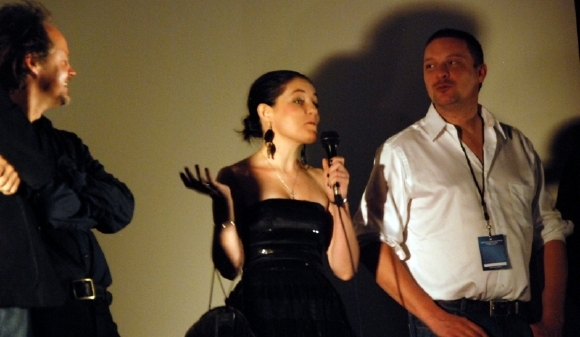 Dr Nathan suggests Glenn McQuaid gets out his writing pad, because one does sense the world will want to see more of this deplorable duo, if for no other reason than to savor McQuaidâ€™s obvious writing talent, and to watch Fessenden and Monaghan chew up the scenery whenever both share the screen, which is often. Monaghanâ€™s portrayal of Arthur is slightly withdrawn and subdued when heâ€™s alone with girlfriend Fanny or Father Duffy, but he comes competitively alive when teamed with the twitchy ball of energy that is Fessenden, who looks eerily like Jack Nicholson of The Shining. And shine he does. Full of facial ticks, winks, nods, that stunning hockey player grin, dancing eyebrows and happy hands, Fessenden portrays sorta slick Willie to perfection, imbuing him with a personality thatâ€™s half realist, half helpless, half Long John Silver on speed. Choose any two. Ron Perlman as the rather odd priest Father Duffy is a treat, playing the whiskey-toting â€œgallows chroniclerâ€ to imposing perfection, acting as our sort of master of ceremonies as he leads the doomed Arthur through a litany of he and Willieâ€™s monty-python-like grave robbing scenes. After awhile you may ask: why is he so interested in certain stories? In the midst of the mayhem is an almost cameo role by Brenda Cooney, who deftly plays the manipulating Fanny in one of the episodes. She starts off as an apprentice to Willie and Arthur, but finds Willie too cautious for her greedy plans, and quickly takes over the gang, resulting in a rowboat ride to recover some undead on an island, with hilarious, yet meaningful results. Unfortunately, this trip has more departures than arrivals. Fan fave Angus Scrimm obviously enjoyed his role as evil corpse buyer Dr Vernon Quint. Oozing inhumanity to man, dead or alive, Scrimm makes life hell for Willie and Arthur, and, in a totally surreal moment, whips out a violin and plays a melody to a fresh new female corpse the boys have just delivered. Hmmm. It has a stake in its chestâ€¦ I wonder why? Digging up much more than human corpses is, of course, the source of much of I Sell The Deadâ€™s relentless hilarity. Their website doesnâ€™t reveal the results of their digging, so Dr. Nathan will leave you with just the beans already spilled. In this case, you can simply trust the movieâ€™s telling tagline: â€œNever trust a corpseâ€. Another ongoing plotline through the vignettes is Willie and Arthurâ€™s tentative association with the House of Murphy, another gang of grave robbers who use mafia techniques to protect their holes. Daddy Murphyâ€™s technique for training son Cornelius is worth the price of admission alone. This truly ghoulish mob, featuring a woman so disgustingly ugly she has to wear a mask, pecks away at the W&A periphery before they finally reach the predictable showdown conclusion, albeit in a shockingly imaginative manner. Technically, thereâ€™s not much to carp about. Sure, thereâ€™s lots of mist in the outdoor scenes â€“ McQuaidâ€™s homage to Hammer â€“ and the monsters are more funny friendly than fiendish, but the cinematography is seamless, the art direction incredible, considering it was shot entirely in New York, the music evocative to the moods without being overwhelming, and the editing is crisp and even. Itâ€™s tight. 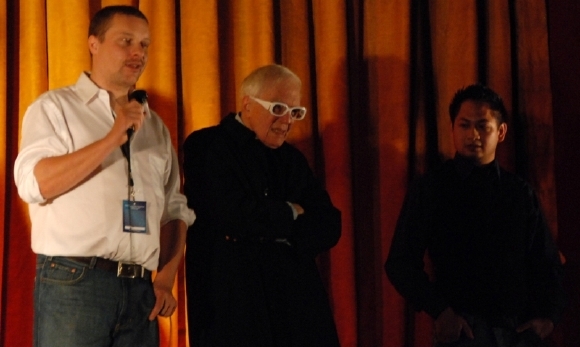 During the presentation following the screening, writer/director McQuaid told the audience he came from a working class Irish background, and he cut his youthful teeth on weekly horror double features, the first a B&W, the second in color, usually a Hammer classic with his two heroes, Christopher Lee and Peter Cushing. Writing this, his first screenplay, was a lot of fun, he told the soldout audience, adding, â€œWhen I thought of Willie Grimes I thought of Larry Fessenden.â€ Much cheering. Crowd fave Angus Scrimm, wearing some kind of zombie 3-D glasses, told the audience he had a great time making the movie, and related the story of how he came to play the violin. Apparently he was over at Larry Fessendenâ€™s home, and discovered that Larryâ€™s son plays the piano. Scrimm made the mistake of telling the son that he once played violin, but was out of practice. Son tells father, and Larry arranges to have a violin solo inserted in Scrimmâ€™s last scene. â€œI practiced that bit for two and a half monthsâ€, Scrimm told the audience. (It was still pretty shaky, between you and me). At the end of it all, there were mostly happy faces leaving the theatre, mine among them. 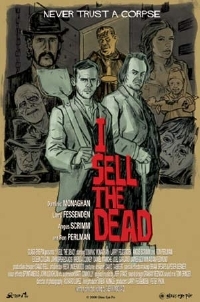 I Sell The Dead is a slapstick semi-shocker, a buddy pix thatâ€™s fun to dig, and the beginning of what might become a Fessenden cult character, with a heads off to Willie Grimes and his nutty nocturnal adventures. If these guys are selling, Iâ€™m buying. 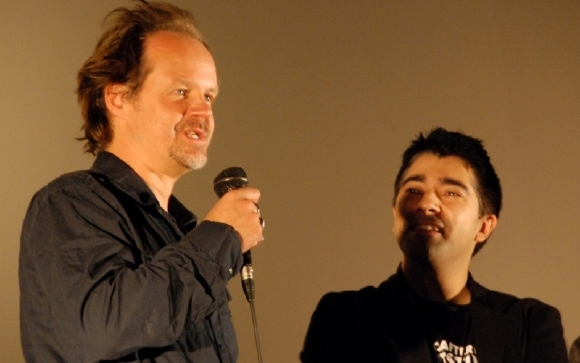 Footnote: Dr Nathan obtained a 45-minute interview with Larry Fessenden the day before I Sell the Dead received its North American Premiere. We talk about lots of cool stuff, including The Last Winter, his fellow stars, directing vs acting, I Sell The Dead, and lots more. Itâ€™ll be posted as soon as itâ€™s transcribed. any word on release? this looks well good.